The event will be hosted by several SBAA Board Members, including Sean Brown, Craig Newfield and Christopher Reichert. 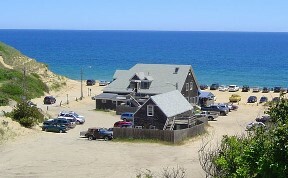 The Beachcomber sits above Cahoon Hollow Beach, which is a picturesque, ocean-side beach in the Cape Cod National Seashore on Outer Cape Cod. It is also one of the few public access beaches in Wellfleet. Rated by Travel and Leisure as one of America's Best Beach Bars, The Beachcomber is right on the dunes with a roofed deck open to the beach and a 45-foot bar. The Beachcomer is a family-friendly restaurant until 9pm, when it morphs into a club with live entertainment - from surf-rock to reggae to jazz. Note: Please note that highways and bridges onto Cape Cod in August are extremely busy. It is approximately 2 hours and 100 miles from downtown Boston to the Beachcomber. Lodging: If you plan to spend the night (or the weekend) in Wellfleet or the Outer Cape, there are a number of hotels, motels, and camping grounds, as well as vacation homes for rent in the area. You can see some of the local lodging options at: http://www.capelinks.com/cape-cod/lodging/ .